Description: Raw mate rial is feed into the machine from equipment inlet and move forward continuously along with the horizontal direction under vibratory power. 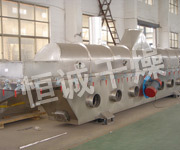 The hot air passes through fluidized-bed and exchange with raw materials'damp. 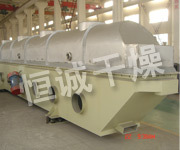 Raw mate rial is feed into the machine from equipment inlet and move forward continuously along with the horizontal direction under vibratory power The hot air passes through fluidized—bed and exchange with raw materials。damp，then the wet air is dusted by cyclone separator and exhausted from air outlet，the d ried material is discharged through finished material outlet. It is applicable for d rying，cooling of powder or granule state materials，such as citric acid，monosodiurn glutamate，borax，ammonium sulphur,compound fertilizer，piece of radish，bean，lees，seed，mine reside and sugar in chemical， pharmaceutlcal，foodstuff，grain，mine and so on industries. ◎Adopt vibration motor，it is smooth in running and convenient in maintenance.The noise is low and the service life is long. 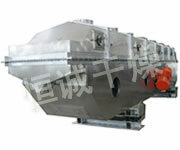 ◎The state of fluidization is uniform and no dead gaps or broken phenomenon so to have dry，cool product. 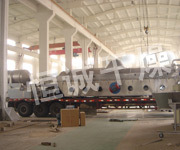 ◎It is good in adjustment and wide in the field of application The thickness of raw material and the speed of raw material to be moved inside the machine and the change of vibration range can be steeples. ◎The structure is fully seal it is effective to p revent from cross pollution of raw materials and the working environment is clean. 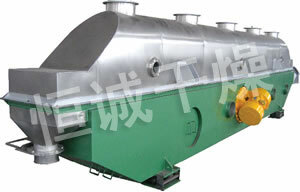 ◎The mechanical and heat are high and its effective of energy saving.Compared to ordinal drye r，30-60％of energy is saved.